Journaling was that classic “diary” writing for me since I was 8. I received my first diary and it was the most therapeutic form of self expression in a “secret” form because, well… aren’t all diaries a secret? I filled those lined pages year after year with everything. I was all over the map of what it included: my daily agenda, the list of what would make a perfect boyfriend, plots of how I wanted to hurt those who hurt me… it was dark & it was light. My thoughts, my words, my expression. And oh, how the self judgement would come out! As each of these judgements came up, I developed ways to move through the negativity and build a foundation of confidence in myself. It became a process of accepting and understanding that I was not my thoughts. It helped me forgive and move on from life’s experiences. My journaling practice became this safe space between just my thoughts and the paper. Over the years I’ve developed journaling prompts, charts, tables, affirmation and series of questions that can shift my mindset within minutes. The mental shifts, the letting go, the moving on, the dream, the lists… they all became this focused energy that has kept me in alignment with who I want to become. Journaling isn’t all butterflies and rainbows every time, but I know that I leave that page feeling so much more knowledgable about myself as I learn out to ask myself the right questions to lean into working through my answers from a space of love. Lately my favourite areas for journaling focus has been unpacking financial fears, dissolving limiting believes and future goal setting. If you’re going through a situation that you feel you need guidance in, try this journaling questions for yourself and see what comes up! If I fully trusted myself in this situation of (fill in the blank), what would be my next step? I always encourage to stay in a state of curiosity and compassion. Join me April 28th in Regina Sk. for a beautiful collaborative workshop with Be Nice Yoga co. where I am going to guide you through a few of these process of shifting our mental energy to create sustainable strategies to keep ourselves living in alignment. If you have any question feel free to reach out via email or comment below! Happy journaling! 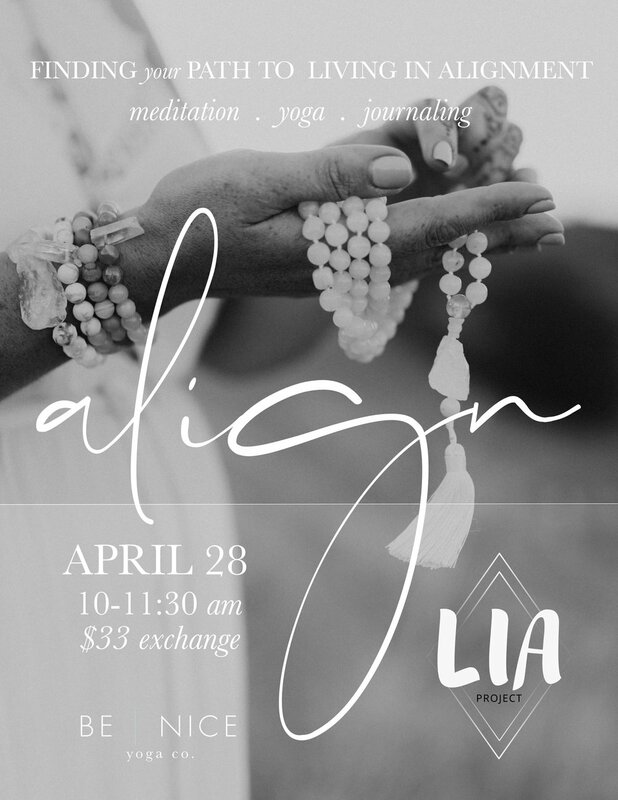 Join us for a morning of connecting with your highest self through movement, meditation and journaling. During this class we will be diving deep into what it means to live in alignment and how we can practice empowering rituals to feel energized confident and balanced daily. We will begin with a gentle yoga practice, followed by a guided meditation to allow for us to connect deeper with our bodies and breath. Spending the rest of the morning with Carolina from Living in Alignment, we will be working through and focusing on identifying areas of mental clutter, transforming that space into positive thoughts and creating affirmations around them. Where: Be Nice Yoga Co. So what is Self Love anyways?